I went to the surface (5 x 7″ canvas panel) with a dilemma on my mind last night, and some luminous Golden acrylic paint on my brush. I find art to be tremendously powerful from a therapeutic standpoint when I can begin with something less than great on my mind, add a color, swish, rinse, repeat…and transform those feelings into something I will be able to smile at in the morning. You know? For some, it may be baking a fresh loaf of bread, or cutting up fabric to sew into a quilt, or taking a walk with that camera, whatever it is. When we create, we transform. It’s a powerful thing. This may not be a finished painting, and it may not hang on a gallery wall, but it was my partner through that mind ramble. I’m finding many of my abstract paintings are like this, almost like visual journals, taking me right back to whatever I was thinking about, celebrating, learning, watching, doing at the time that work came to life. I hope your Tuesday brings a fresh burst of transformative energy your way, like a fresh spring breeze at 72 degrees. Peace. You’re so right about memories being attached to what we create. I love looking through my old sketchbooks, and even the simplest line drawing can put me right back at the time and place where it was drawn — and bring back a rush of emotions, as well. With all the vibrant colors in this abstract, it will no doubt evoke emotions in anyone who sees it. It has a very powerful quality about it. Thanks, Judith. It was a journey. Almost every abstract painting is, for me. We change the surface and the surface changes us right back. It’s nice now to actually have dated work from a year ago that I can look back and remember! I never had this before. How far do your sketchbooks date back? Wouldn’t it be cool to have artwork inspired by our babies? That would be the most wonderful thing ever, I think. Thanks, ‘nista. I’m always so glad to hear you say that you knew something was mine. This felt so different to me from anything I’ve ever done, but the dilemma was also something that’s never come up, so maybe that makes sense. It really does help to bring a problem to the page and see what can be done there to fix it. Do you do this with your watercolors, or your photography? So powerful. Glad you enjoyed this! I do. But it’s more usually in the words I choose to go with photos. I take them then I look at it and let it speak to me. Sometimes it comes right away and sometimes I have to look at it again and again. With the art it is harder for me but i still feel so amateur and less secure about it which is ok. It is a journey. Getting ready to head out on an excursion adventure. Happy day loo! Wow, thanks, Rebecca, and coming from someone who doesn’t really like abstracts, I’m taking that as a really nice compliment. What this scene needs is a leaping hare lol! Glad you enjoyed it and I’m glad you find your work can take you right back to a space in time as well. Wow what a blast of brilliance! So powerful! Thanks so much, Cathe. It was a journey, alright. Glad you enjoyed it! Love what you did here! Very inspirational thoughts; thanks for sharing. Wishing you lots of creative adventures everyday. Thanks for your comment and the same to you! Thanks, Denis. I actually saw them too as I was finishing this piece and really didn’t intend it, but there it is. Sometimes flames bring transformation too. I appreciate your feedback on this. Dear Laura, the layers of color and movement are just what I needed today. Free flowing paint can bring joy, resolution, new insights, a here and now moment, all needed to keep our balance. I’m enjoying all of your May Madness posts. Thank you for the balance today! Thank YOU Sharon, for your always wise thoughts. I’m really glad this piece spoke to you today. Energize, my friend! We all need that, right? Very nice! Your art today put me in the right mood for a Tuesday. Thanks so much, Youanna! I really appreciate your comment. Need the energy burst today as I stayed up too late last night painting hehe. Glad a wonderful mood is settling over you today. Aww – I love your words as much as this painting! Such a beautiful way of framing it – as it being your partner through your mind ramble. Beautiful sentiment and beautiful art. It looks complete to me also. It has a quietly beautiful energy and I like it a lot. N.
Thank you, Nina. I love the way you worded that. I really appreciate your comment. Have a good night. Patsy, you are the sweetest! Thank you! In this case, I do think the emotions led the way, and as you said, it worked out in the end. Def. had its ugly stages along the way, but I kept going with it. Didn’t wanna walk away until I was happy. Thank you. You have a wonderful way of saying things, Laura! I love this post, it speaks to us all as an artist in our own way and right. Gorgeous abstract, love those marsh grasses in the gentle breeze! Deborah, I love the way you interpreted this painting! Wonderful! I hope you write a book someday and illustrate it with your wonderful images & artwork. Thank you. Thanks, Jean! Glad you enjoyed! It is cool, and so refreshing, Margaret. Thank you so much for your feedback! Love it Laura! Got to love a therapy session at the easel!! Nothing better, huh, Susan?? Thank you very much! 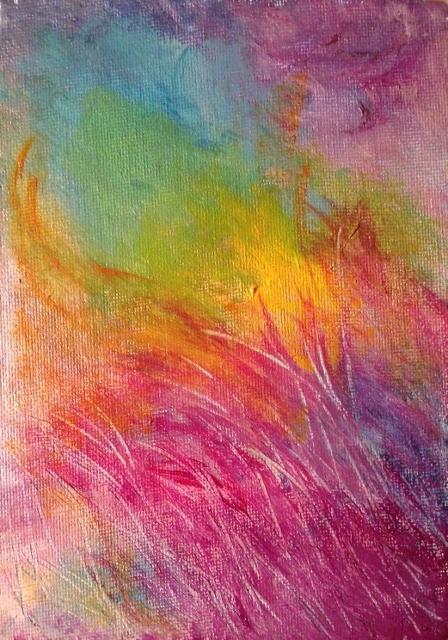 I do know and really adore the colors you used and the energy in this abstract piece you created, Laura. Your message is a special one – it speaks to many of us, myself included. Transforming energy from thought to art and back again. Rinse repeat! Yes! I’m so glad you enjoyed, C. Boy, we could all rinse and repeat forever and just keep churning out art all the days! Thank you. It would save a lot on paper and canvas lol! I was thinking about rinsing brushes but paper and surfaces works too lol! Thank you so much for your enthusiasm and encouragement, Clinock. Really means a lot! Wow, thank you, Stephen! I would actually like to do a whole series of them. Really glad you enjoyed it so much, and thanks for letting me know! Thanks so much! I am about to reveal a secret about those oranges this weekend – they were actually painted by my daughter in high school in oils. Her teacher had them doing 30-minute painting exercises each day, I think, and this was one of the results. I just love her painting and all of her artwork, and I hope the comments here will encourage her to paint again. That teacher was her instructor for her final year of high school and made a practice of demeaning most of the students’ work on a regular basis…..and she convinced her that she lacked talent. Very unfortunate that teachers like that still have jobs, but there it is. I am so glad the artists, including you, responded so enthusiastically to her painting. She saw the comments and I think it really helped. Thank you. Beautiful and fluid piece of art Laura – love the movement and combination of colors. Thanks, Mary. I enjoyed doing this one and thinking about others. Glad you liked it! Love these rich, vibrant, yummy colors! Would make a great body of work if you did a series of them! Go for it! I’ll have a go at another one tomorrow! Thanks for the encouragement. Much appreciated! You know, I was just thinking that…..I’ll sit down with a few colors and see what happens…..and if it goes in a different direction, best to just let it! I did a small series of grid paintings that everyone said looks like windows a few weeks back, and I’d like to continue with those too. It’s been a fun way to get to know acrylic paint. I have a feeling I’ll always prefer abstract acrylics to anything I attempt realistically. Realistic for me works better in pencil or pen – so far, at least. Did you used to work realistically at the beginning? Yes! I totally understand! I still try to draw every day – mostly animals, birds, I really do love faces – but abstract for me is just totally fun. I know there is so much to learn but as I try to learn and watch videos constantly, etc., I am really just having fun exploring a new medium. Totally fun! We all need more FUN in life, don’t we?!! Thanks so much! This one turned out being really fun to complete. It was quite a journey though and it went through its gawky teenager stage lol. Glad you find it energizing! So much creative energy in this piece, love what your doing, and the color choices. Thanks, Jennifer, I’m finding tremendous freedom in acrylics. I never thought I would enjoy them but I really do, and as much as I still love wc, I think it was holding me back. It is a sassy mistress! One never knows about her mood. Really enjoying acrylics though and I’m glad you like this one. I’d like to do a series of them. Yes I can tell you enjoyed painting it. Definitely have to explore more using acrylics. I like painting with acrylics, I enjoy watercolors as well. Thanks, Jeanette! This is one of the few that I am pretty happy with. haha, notice it’s not watercolor. She stomps on me too much, and I’ve not learned to dance w/her the right way yet. Glad you enjoyed this! Acrylics are fun. Like playing in a sandbox!